The INS Sindhurakshak is heading to Mumbai on the route, which is now legally recognized to be under Russia’s control. Since January 27, a law came into force in Russia which regulates trade navigation via the Northern Sea Route. Thus, now, this route is legally recognized to be under Russia’s control. Experts say that in several years from now, the Northern Sea Route will most likely become the main artery connecting Europe and Asia. The political and economic importance of the Arctic region in increasing with each coming year, and it very good news for Russia that after a long break, it is starting to explore and exploit this region again. After the collapse of the Soviet Union, the Russian Federation became its legal successor. But until recently, Russia’s authorities paid little attention to the development of the Arctic, because there were too many other problems to be solved. Things started to change only several years ago. Recently, Russia’s authorities announced that developing the Arctic Region, and, in particular, the Northern Sea Route should be one of Russia’s top priorities. Besides the Northern Sea Route, the main alternative way from Europe to Asia by sea is via the Suez Canal. But the Northern Sea Route is twice shorter and much safer, and, thus, it is small wonder that more and more European companies are now starting to prefer to deliver their goods to Asia by the Northern Sea Route. The main obstacle on this route is ice – but there is every reason to hope that with the current rapid development of a fleet of icebreakers in Russia, the ice cover of northern seas will soon become a minor problem. At present, several icebreakers are being built in Russia, including a nuclear one. The decision to revive the Northern Sea Route was announced by Russia’s President Vladimir Putin in December 2012. He said that the Arctic region, which is currently badly polluted in many places, should be freed from this pollution, and that security services should start working along the entire Northern Sea Route. In January, Russia’s Ministry of Emergency Situations announced that it is going to open 10 rescue centres, equipped according to the latest requirements, by 2015. These centres will provide the security of employees of Russian companies, who are working in this region, and the safety of vessels that go by the Northern Sea Route. In the near future, a government administration of the Northern Sea Route will be formed in Russia. The duties of this administration will also include monitoring the ecological situation in the region. The number of ships that go by the Northern Sea Route is constantly growing. In 2012, this number grew by one third in comparison with 2011. In particular, a tanker called “The Ob River”, which transports liquefied natural gas (this is the first vessel of such type in the world), sailed from South Korea to Western Europe by the Northern Sea Route. 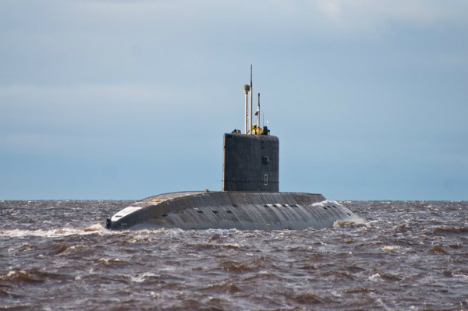 The INS Sindhurakshak, which was repaired in the Russian city of Severodvinsk, will return to India by the Northern Sea Route. On the way, the submarine will be accompanied by several Russian icebreakers. Within the last 3 years, the number of ships sailing by the North Sea Route has increased 10 times. According to experts’ estimates, the amount of transit transport by the Northern Sea Route may reach 6 million tonnes in a year in the eastern direction, and 3 million tonnes in a year – in the western. Russia is pinning much hope on the new port, which is now being built on the Yamal Peninsula, which is washed by the northern sea of Kara. It is expected that this port will be a relay point on the Northern Sea Route. First published in the Voice of Russia.